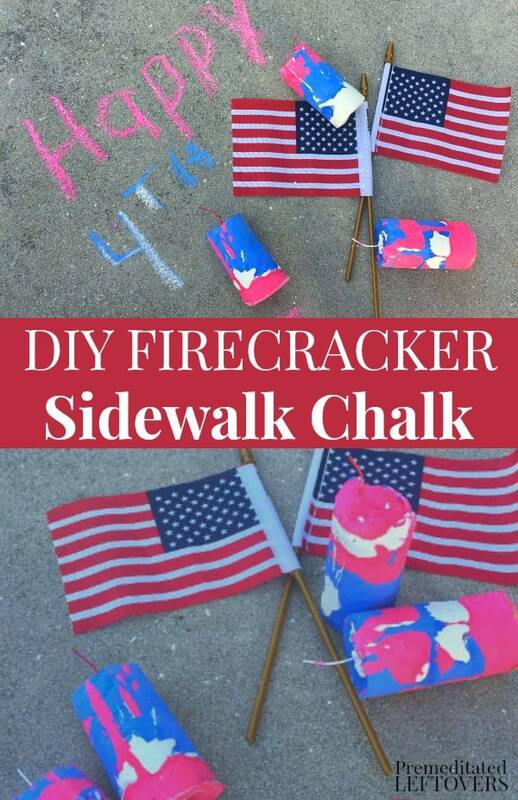 Use this tutorial for how to make Firecracker Sidewalk Chalk to make red, white, and blue sidewalk chalk for your 4th of July celebration. 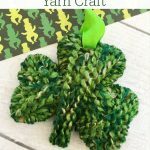 I love inexpensive summertime crafts that keep the kids busy and my kids enjoy getting to make AND play with this one! A $5 box of plaster of Paris and some tempera paint create dozens of large sidewalk chalks that will have them drawing from when school lets out until the first bell rings on the new school year. This batch I got a little creative and made Firecracker Sidewalk Chalk to pass out to all the kids at our yearly 4th of July BBQ. 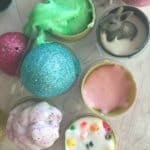 This sidewalk chalk recipe will fill 5 toilet paper roll molds, bear in mind the toilet paper rolls are much larger than the pieces of chalk than you typically buy. Tape off one end of your paper towel rolls completely with duct tape to create a mold. 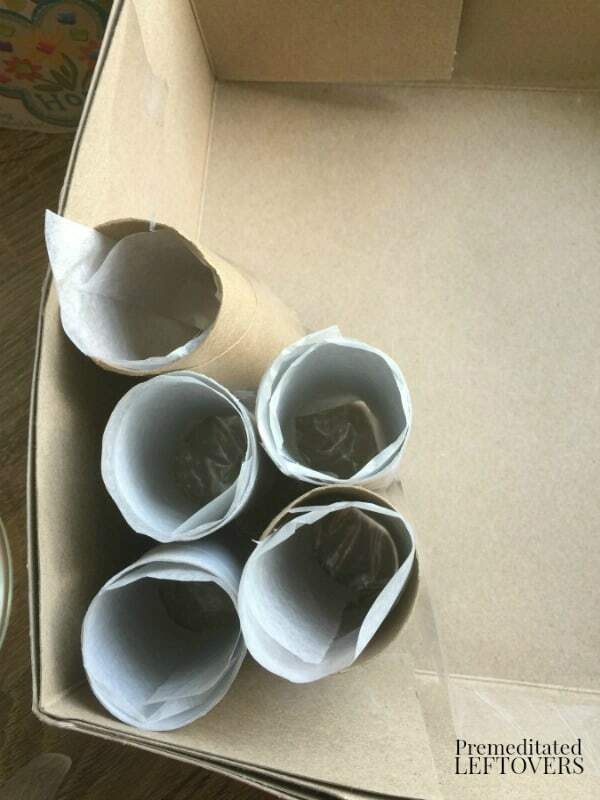 Cut a piece of waxed paper to fit the inside of each of your toilet paper rolls and place inside like this. Place your rolls in a container with high sides to keep them upright, if you don't fill it with molds you can stuff newspaper or something around it to keep all standing. Divide up your water into the bowls depending on how many colors you want, I am going with red, white, and blue so I divided it evenly among my 3 bowls. 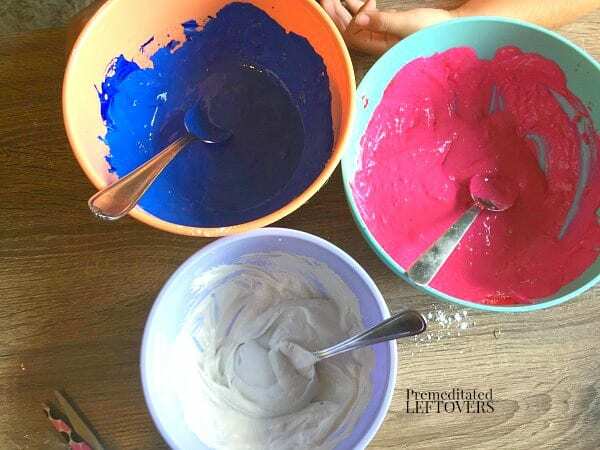 Add 1- 3 T of tempera paint in your choice of color to each bowl depending on how intense you want your color, I used 3 (it's hard to get a true red mixing red into a white base). Stir well to mix. 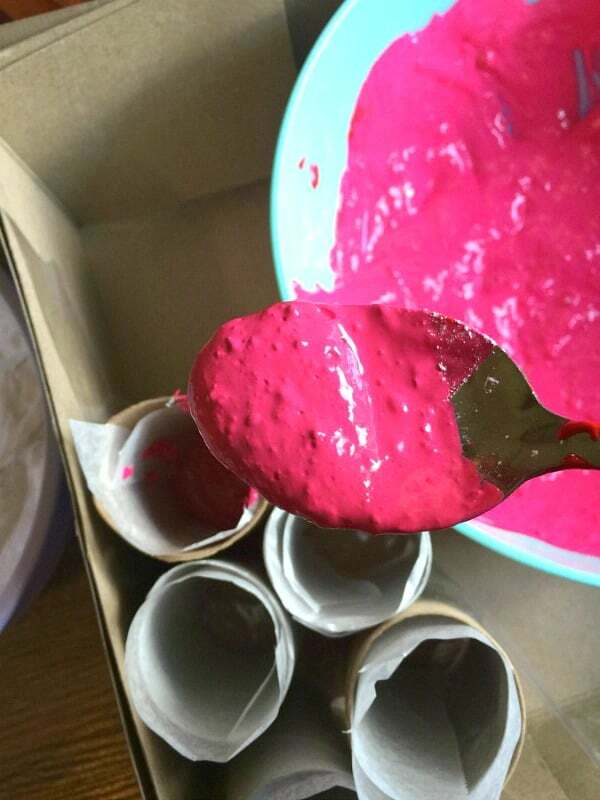 Finally, mix in your plaster of Paris divided evenly among the number of colors and stir quickly and thoroughly. 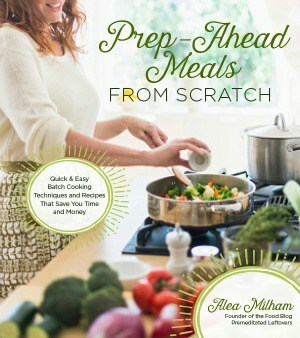 Carefully pour into your paper mold, inside the waxed paper. 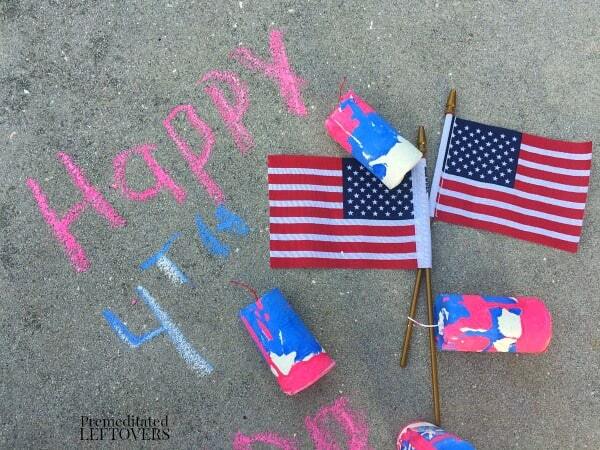 We layered our colors to make it fun and patriotic! 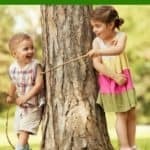 Allow your chalk to dry and harden for 24-48 hours. 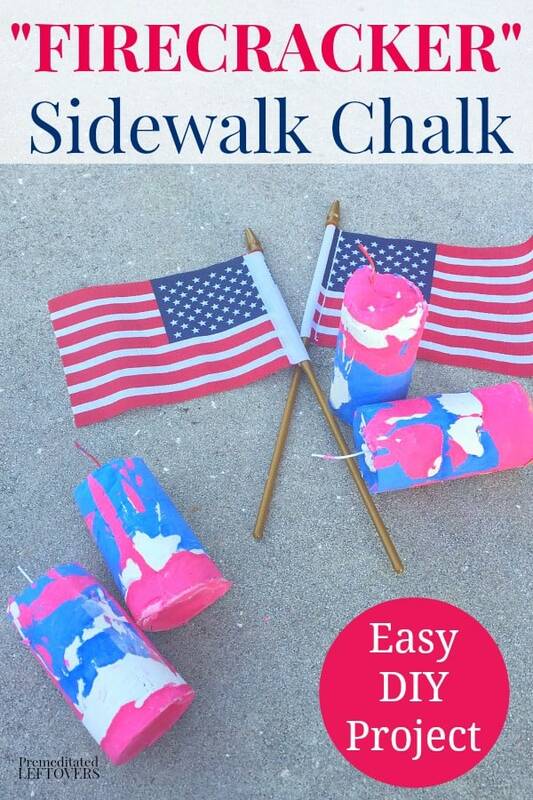 These DIY Patriotic Sidewalk Chalk Sticks make a great party favor for the kids at your holiday celebration! So cute! I think this would keep my kiddos happy and busy during the downtime before our block parry fireworks.